Jordan, a lifelong comic book fan, and his friend Charles were discussing the DC comics villain Mr. Mxyzptlk and made a wager: if Jordan's friends could trick him into saying his own name backwards, he'd owe them five dollars. Charles says the group succeeded using Jordan's middle name -- but Jordan refuses to pay up, saying the middle name doesn't count. Who is right, and what's in a name, anyway? 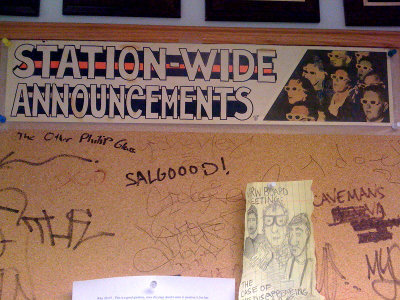 Exhibit A: One of the ways in which they planted the idea of saying Salgood was instituting it as a meme at their radio station - see attached photo of "Salgood" graffiti. Exhibit B: "The station ID recording we made with our friend Nick where Jordan's voice is reversed as he says his name." Jordan's smugness and ego is a bit galling. How dare he say he can't be fooled into saying his name backwards! How can he think himself more cunning than a being from the Fifth Dimension? I think his friends just went about it all wrong. It'll happen, Nadroj. It'll happen. Your honor, I must take issue with one point you made in this hearing. I am a 25-year old male who goes by his middle name. I have done this my entire life. Reason being, my parents called me by my middle name since birth, choosing to give me my father's name as my first name in a quasi-traditional spirit. So my name is X Y Z. The fourth X in this branch of the family tree, but the only one to be explicitly called Y. The only time my X even came up was during the first day of a new school year and on government forms. On the street, should someone shout "Hey, X!" I know I wouldn't instinctively pick up on it the same way I would were it "Hey, Y!" So what am I to do? I'm cursed with having to awkwardly explain this predicament every time I get to know someone beyond the level of an acquaintance but legally changing my name to Y X Z would be a hassle in more ways than I can count and to little relief. Even if you don't have any guidance for me here, judge, I just wanted to set the record straight that not all of us middle name bearers are involved in some sort of post-high school reinvention. Or check out this fine acoustic rendition where you can hear the "dri" of drive (if not the "ve") a bit more clearly. Starts around 2:55.